1. Make sure it has a prominent yellow spot. This is where it sat on the ground ripening. 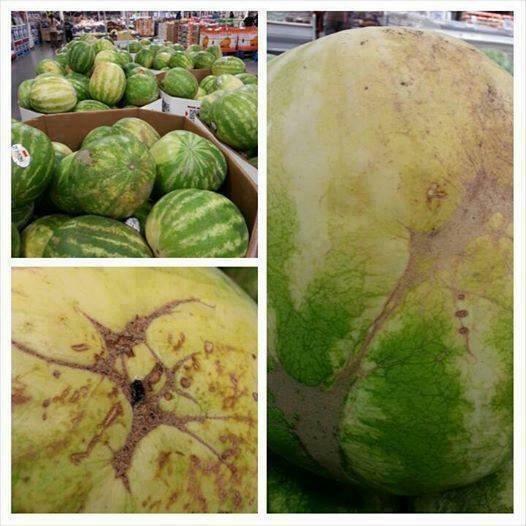 No spot = premature pick = not ripe. 2. Look for "webbing". This is the brown, course web looking material. This is caused when bees pollinate the flower and scar the membranes that later forms the fruit. The more pollination = more webbing = sweeter fruit. 3. Look for black hard globs seeping out. This is sugar not insects or rotting. AND...if you see all of the above AND tap on it and feel a "rebounce" effect, that is another telltale sign of ripe and sweetness.